As an innovation moves from idea to application a variety of changes have to take place. The emphasis moves from divergent thinking about exploring possibilities towards convergent thinking focused on exploiting opportunities, with an intermediate process of evaluating options identified and deciding on implementation and resourcing strategies. 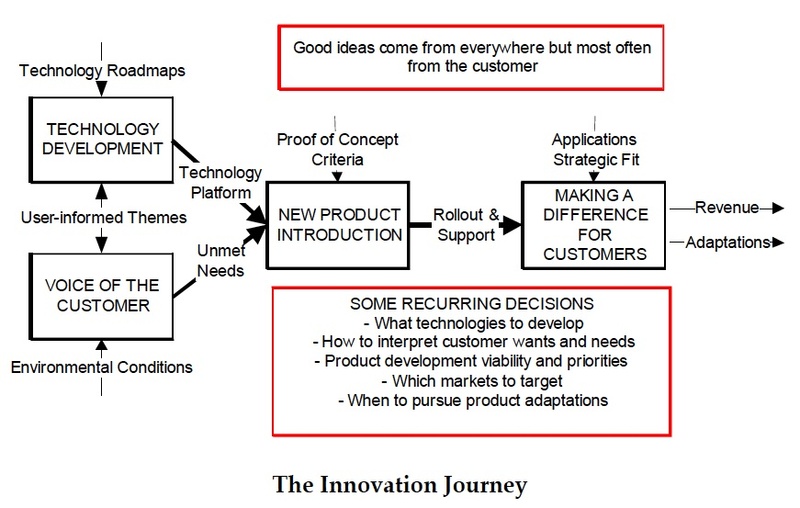 The innovation journey of a business oriented innovation is illustrated below. An innovation intended to deliver social benefits will follow a similar path, but with different communities and possibly different technologies being involved. Each item mentioned in the diagram can be a story on its own, and the recurring process of explore/evaluate/exploit (see sidebox) can be observed within each item, e.g exploring the voice of the customer. Innovation is often linked to the development and introduction of new technologies, but we can be innovative in the way we do things or the way we combine established technologies. We can also be innovative in the way we go about innovation management. Some possibilities are illustrated in the innovation landscape link in the sidebox.